Knowing how to start the yarn on a crochet hook is your first step to crocheting. 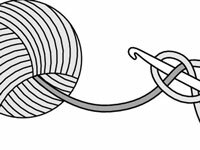 To start the yarn on a crochet hook, you first wrap the yarn around your yarn hand and then create a slip knot on your hook. 1Bring the yarn up between your little finger and ring finger. Start the yarn from underneath your hand. 2Wrap the yarn around your little finger. Look — it’s a ring made from yarn! 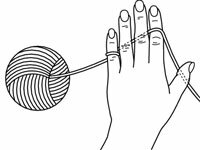 3Draw the yarn under your ring finger and middle finger, then bring the yarn up to the top of your hand between your middle finger and forefinger. Lay the yarn over your forefinger (or index finger or pointing finger). 4Make a loop that looks somewhat like a pretzel. Begin about 6 inches from the end of the yarn. 5Insert your hook through the center of the loop and draw the working end of the yarn through. This step creates a slip knot. 6Pull gently on both ends of the yarn to tighten. If pulling on the working end of the yarn doesn’t tighten your slip knot on the hook and yanking on the cut end does, you made your slip knot backwards. Simply remove the loop from the hook, tug on both ends to release the knot, and try again. A starting slip knot should slide easily up and down the crochet hook’s shaft, but shouldn’t be so loose that it slides off over the end of the hook. If it’s too loose, gently pull on the working end of the yarn to snug it up. 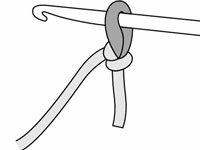 If your knot is too tight, tug on the loop to loosen it.